' Pool Noodle Light Sabers - Sisters, What! My sister in law sent me these awesome pictures to me one day. Think you that Jedi are boys only? Think you that girls don't love star wars? ok, that's my attempt at Yoda talk. Let's just say these girls have been fed a healthy dose of Star Wars by my brother and they totally love it!!! Captain Awesome has recently caught the star wars bug, like for real. He's always thought it fun whenever hubby has brought out the light saber, but he's starting to get old enough to really understand how cool it is. 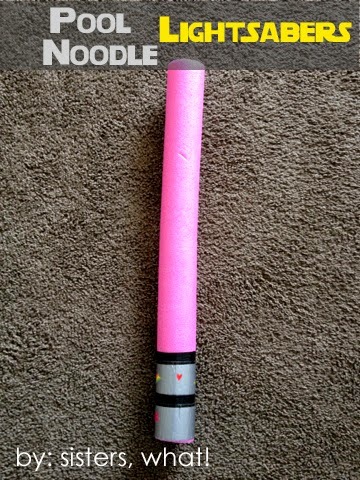 So I think pool noodle light sabers will be happening in our house this summer. //2// to create handle duck tape the bottom. Then with black permanent marker or black tape, make contrasting lines. And seriously, aren't these girls too cute.